The murders of Michael Brown and Eric Garner have reverberated loudly worldwide. From New York to Palestine to Mexico, young people are fed up with this racist system that sanctions the death penalty for stealing a piece of candy, and are connecting their struggle across borders. In London, too, thousands of young people have taken to the streets in solidarity. There are commenters that seem to wonder why two deaths in America have triggered such a response in the UK. The answer to this is clear. Police brutality has been an issue in Britain for a long time, with the killing of people like Mark Duggan only representing the tip of the iceberg. Since the 1960s there have been thousands of deaths in custody and in the hands of police, with the killers seldom, if ever, brought to justice. Throughout the entire world, racism is used to divide the workers, making them compete for crumbs on the table while the ruling class takes the whole pie. The police at the end of the day are the running dogs that enforce this rotten system — their allegiance is only to private property. 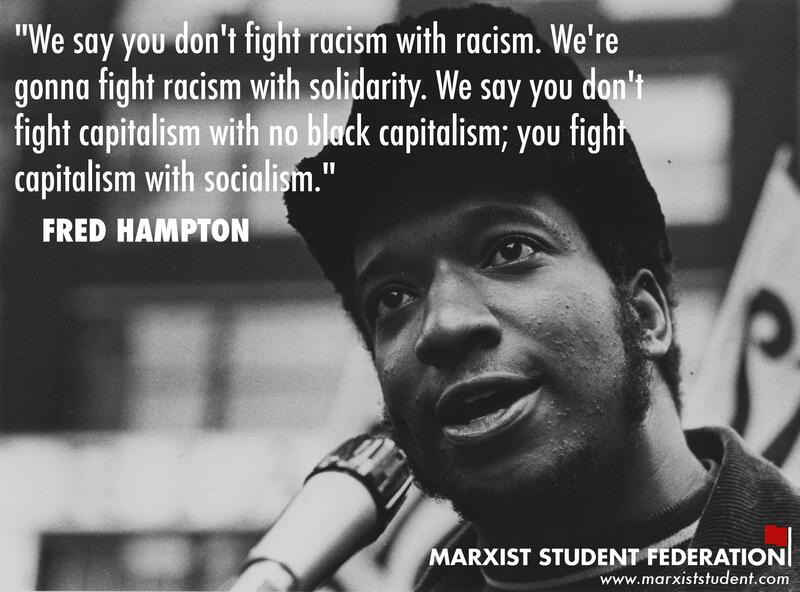 The Marxist Student Federation (MSF) fights for every genuine reform against racism that is possible, and also actively stamps out any elements of racism within the revolutionary movement. But we must also understand that racism ultimately has its roots in class division, and therefore can only be destroyed if its material base — capitalism — is destroyed. For this reason we have intervened with the sobering words of the great revolutionary martyr Malcolm X: “You can’t have capitalism without racism”. Several members of the MSF attended the #LondonToFerguson vigil for Michael Brown in front of the US embassy, which unexpectedly turned into a demonstration. There were at least 1,000 people – mostly young, black, or ethnic minority – showing solidarity with Ferguson and opposing racism & police violence at home. The mood was more radical than on any demonstration we’ve seen this year. We made a sign with Malcolm X’s quote “You can’t have capitalism without racism”, which had a great response, as did our leaflets that explained the context of the quote. The leaflets were taken with enthusiasm by everyone, and many people stopped to take pictures and ask us who we were. The positive reception of our material showed that there’s a deep-seated sense of indignation among young people, a feeling that goes beyond this specific event and connects it to wider, systemic oppression. It is through this enthusiasm that racism will be overturned, but this process can only be successful if it is brought together with the power of the organised working class. On Wednesday 10th December members of the MSF attended the “die-in” to show solidarity for Eric Garner and Mike Brown at Westfield shopping centre in White City. The protest itself was organised by London Black Revs and was attended by mostly young students. Around 500 people turned up in total. The atmosphere was very good, with plenty of slogans being chanted. We brought a sign that another member made which had written on it the quote from Malcolm X “You can’t have capitalism without racism”. The slogan clearly and concisely conveyed our message that the struggle for justice and equality for black and other oppressed peoples, is the international revolutionary struggle against capitalism, which engenders and perpetuates these prejudices. The sign and our flyers were incredibly well received, as it was at the previous protest over the killing of Mike Brown. I have never seen a slogan speak so clearly to people. Tens of people wanted photos of it, and we got many handshakes and thumbs ups. Once the protest left Westfield we rallied at Shepards Bush to hear different speeches, and then attempted to re-enter Westfield. The security guards blocked the protesters, but could not hold them back, and the march continued peacefully through the shopping centre. There have already been attempts to dismiss the protest as violent, and almost 100 protesters were arrested for “violent disorder”.